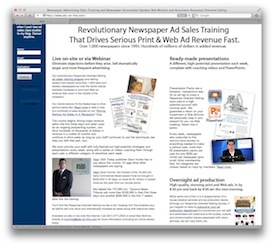 Driving Serious Newspaper Ad Sales: A $25,992 sale with their first Presentation Pack! A $25,992 sale with their first Presentation Pack! Congratulations to Vince Visciano of Bee Newspapers for taking my ad sales training videos and sales materials in this week's Presentation Pack (their very first one!) and turning them into a major sale. 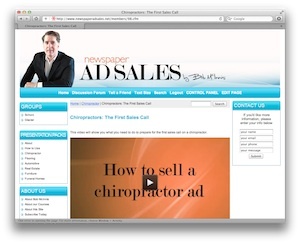 My first week's Presentation Pack coaches the staff through making a major sale to a chiropractor, and Vince's account is running full color in six of their community newspapers for six weeks for a total sale of $25,992. Not bad when you consider my service costs $250 per month and includes my monthly live award-winning Response Oriented Selling ad sales training and training for new ad reps, too. Vince wins a $50 iTunes Gift Card for being the first person at his newspaper to a sell Presentation Pack. According to Vince, "the wife of the chiropractor believed she had written the book on advertising and that running an ad more than once was simply a waste". "Taking the spec ad and the breakdown on layout and how to sell it, I went through the process the same way Bob explained in the accompanying videos for that ad. I made a case why the content needed to include details about their technology and the doctors'. I also walked them through Bob's justification for the size and frequency. They loved the ad and bought into the size, frequency, and content just like Bob predicted they would". Vince goes on to say, "This Presentation Packs service is awesome! We're on constant deadlines here and to have someone like you who can work out the entire sales process and presentation for a prospect and then show us exactly what to say and do with every stage of the sales call has been invaluable to me. I can see it's really going to help me grow my account list. Keep setting them up and I'll keep knocking them down!" Now it's your turn. To see the ad and the accompanying step-by-step videos, PowerPoint/Keynote files, and sample ads, you need to be a small membership fee. Then, for only $250 per month, your staff can have access to this powerful set of sales and coaching tools that helps, a new one every week. Since it also includes monthly Response Oriented Selling training and my very popular new-hires course, you'll find it's like having your personal in-house sales trainer, coach, and new business development manager all rolled into one, helping to ease the heavy workload that your ad director and managers are most likely living with (aren't we all? ).